Okay okay, now that you know me a little bit, have some questions and answers! When did you start quilting/who taught you? I starting my quilting journey in January with the Skill Builder BOM over at Pile o' Fabric, then went on to start Swoon in February. I'm self-taught, by which I mean I sit by myself at home and pore over tutorials and videos and tips and tricks all day, haha! I just recently joined my local quilt guild, and I'm really looking forward to having a lovely group of people around to guide me throughout my beginning stages. It's important not to fall into bad habits! I will say that I've been really honest with myself through the process, by which I mean that I haven't done much taking apart and re-doing of anything, unless there's nothing salvagable about it. I really like having a record of my learning stages, and seeing my seams slowly start aligning more and more! I hold myself to higher standards with each new project I take on, so I don't stay lazy about certain things. I think it's working out fairly well for my first few months of quilting! I started this blog to be able to have a place to readily open myself up creatively by sharing my work, get feedback, and be able to start being a true part of the quilting community. I love being on Instagram and sharing and exploring there, but it's obviously limited compared to having a blog! By the way, if you're wondering about the name, it's really just a name I came up with one day that amused me. I needed a new aim handle and was thinking about variations on rainbows or something. I like it because it's sort of like, a sentence - The rainbow revolts! Like it's an uprising! Or it sort of sounds like a band name, yeah? Introducing, The Rainbow Revolts!! Or it could be a criticism, such as, "[That] rainbow revolts [me]". Revolting rainbows. Horrifying! I have no idea where I'm going with this now, haha. Swoon progress! Block 7 is patiently waiting to be sewn; 8 & 9 have fabrics picked but haven't been cut yet! What is your favorite/least favorite part of sewing/quilting? I actually haven't finished a full quilting project yet - crazy, right? I can definitely say that my favorite part of sewing in general is the fabric. I love fabric! It's the best way I've found to satisfy that urge for color and design in my life. When it comes to quilting, this makes my favorite part the planning process - being able to touch the fabrics and test them out together and make something harmonious. It's so fun to play around with textures and prints and colors! The rest of it is all the actual hard work and follow through, haha. My least favorite part is ironing (during the winter it's my favorite part, oddly, but during these 100+ degree summers? Ehhh...), closely followed by attempting to take reasonable pictures with my cell phone. My husband said that after I finish my third quilt we can save up for a good camera for me - a good deal, I think! My Scrappy Trip Alongs. I'm not terribly good at them yet, but I'm sticking with it! 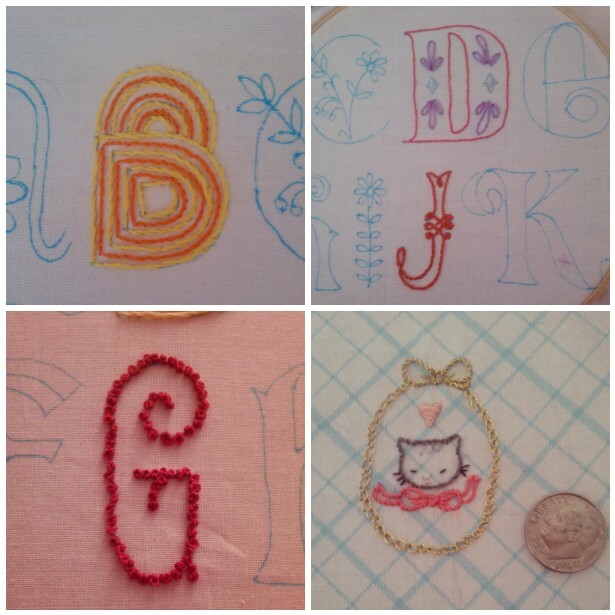 Right now, my hobbies are centered around crafting - lots of cross stitch and embroidery, especially! I used to do lots of garment sewing/modifying, not so much anymore. I also do some work with coloring for lineart! I don't make much time for it anymore since I get antsy sitting on the computer too long these days, but it used to be one of my favorite creative pasttimes. Video games are another hobby of mine, me and my husband are currently playing through Ni no Kuni - highly, highly recommended, by the way! I love movies as well, classics and new; especially anything by Sofia Coppola and Quentin Tarantino (both for very different reasons, mind you!). What other social media do you actively use? I'm on Instagram pretty much all day, these days! It's so perfect for us crafty types, huh? I have a Pinterest account as well, but I don't use it all that often! 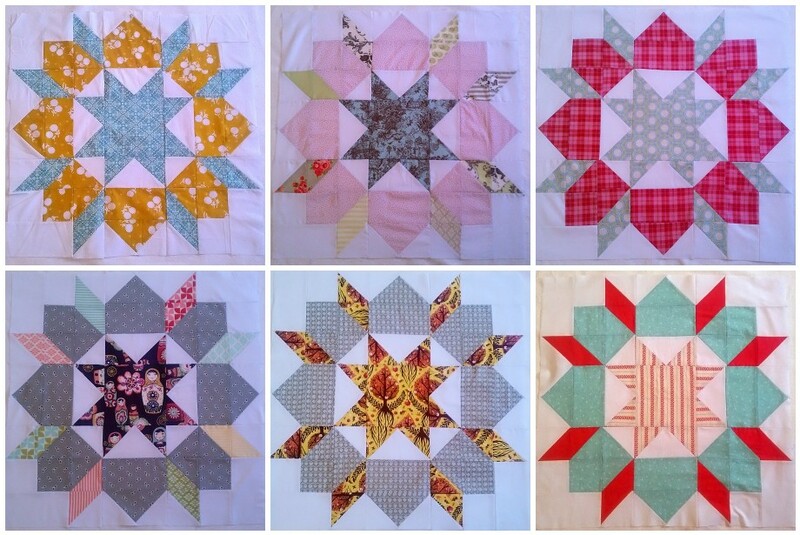 Foundation paper pieced desserts from Ellison Lane Quilts' summer sampler series! Do you have any quilting or blogging questions? So go visit them, too! ♥ Have a great weekend everyone! It's so nice to get to know you better! 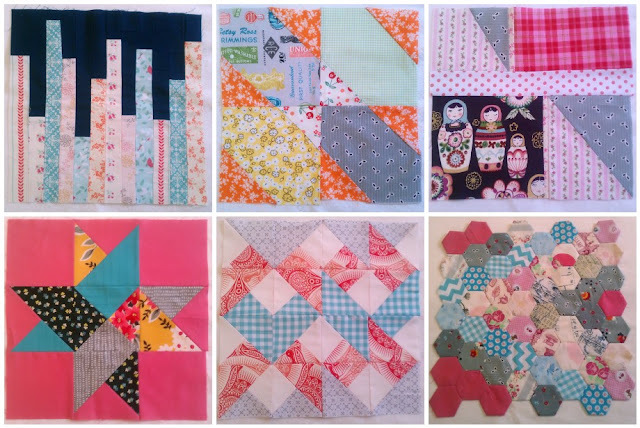 I really enjoyed your post, and just love looking through all of your projects (love the swoons)! I'm already following on Bloglovin'! It has been such a pleasure to get to know you through the blog hop, Gwendellyn. I really enjoyed learning more about you and seeing all your quilty projects! Especially those desserts! It is so great to welcome you! I love all your projects! Everything looks beautiful! I especially love the desserts..that looks like a tough project. So nice to meet your! How fun to see your style. Hi, Nice to meet you. I have really enjoyed looking at your work. I love your blog name! Very intriguing:) I am in love with your swoon blocks and your handwork. Quilting definitely changed my life. It is really my passion and once I dove in I have never been happier:) My favorite saying is "Either you like quilting, or you're wrong!" So many projects. You're making us all look bad. Thanks for participating in the blog hop. It has been great to get to know everyone. Nice to meet you and wonderful projects. What?? You live in Tucson, too? How did we not have a "where are you from" e-mail thread so we could learn important things like this? Totally agree about ironing in Tucson in the summer. It is seriously awful (especially when you only have a swamp cooler- ugh!). Hi! Nice to meet you on this blog hop! I agree...it has been a tremendous amount of fun and information! And I had the same thoughts about quilting when I began a year ago. I thought all quilts were a certain traditional, dark brown fabric style and then I discovered all the bright fabrics and patterns of the modern quilters! Yeah!! Continue having fun with the piecing! You will finish a quilt and it will feel amazing! I love the blog hop, it has been wonderful to get to know everyone. I think you have done a great job with all your blocks and projects. What a nice variety. 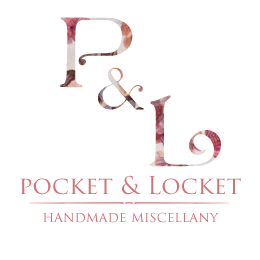 I love the posy fabric, lovely quilt. OMGosh - your Posy quilt is looooovely, I do so love me some Posy. Quilting has changed my life by giving me an artistic outlet. I have tried many many things to try and express myself creatively and have never felt they 'clicked' but quilting has CLICKED for me and gives me the expression I was needing, I love that!!! HI! Lovely to 'meet' you although I have visited before :) It's always nice to find a fellow new blogger and quilter. Love your posey quilt it's beautiful and the Skill Builder BOM...I nearly started that but got sidetracked by other things. No tips for you, but I know that since starting blogging it has really spurred me on creatively. I hadn't done anything arty for years because of limited confidence, but things have changed since quilting so yay for quilting!! So great to meet you! I've been loving how active you are on Instagram :) Quilting changed my life by becoming my career :) It's my moment of zen in my crazy life! So nice to meet you, Gwen! I honestly cannot believe how much you've gotten done, considering you only started quilting in January!! Seriously impressive. And I also started sewing when I was little; I definitely think it made it easier to jump into the quilting game. Can't wait to see what you come up with in the future!! Great post Gwen and nice looking blog! Paper piecing is my favorite so I love your dessert blocks :) I love the Swoon blocks too. I missed out on that first "Swoon Along" when the pattern came out but hope to maybe join in on the new one starting soon. I would love a new quilt for my bed! Holy crap, you've gotten a lot done since January! 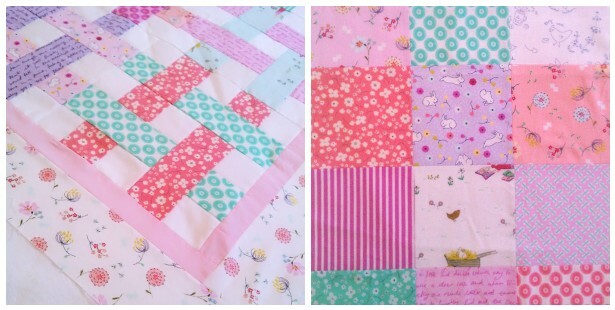 I lurve that Posy jelly roll quilt - it's gorgeous! I would definitely encourage you to jump into quilting your own quilts - straight line and FMQ. For some reason I think it's easier to learn if you start quilting at the beginning, and it certainly helps get quilts finished! Lovely to meet you! For me, Quilting keeps me happy and in a positive headspace. After the most frustrating work days I can come home to my sewing area and even just pottering around makes me feel good! Quilting has definitely changed my life. I find it therapeutic and helps me escape from my work stress. There is nothing I look forward to more after a stressful day at work but to go home and sew a few stitches on my machine. It has also allowed me to make new friends and I have met a great bunch of people via my blog and quilting. Love your summer sampler blocks - adorable! I love the idea of not unpicking too much and having a record of your progress! I think the thing that's improved my quilting the most is just doing it (!) well that and finding the balance between all the inspiration that is here and putting it into practice! It was so nice to get to know you. I cross stitch too, but prefer quilting because I definitely finish quilts faster than my cross stitch projects. I have had one of those going on now for 7 years! I just love your scrappy trip along blocks. I want to make some of those as wel. They are definitely on my to do list! i definitely love the american heritage aspect of quilting! with the modern twist, of course. pink, pretty, floral - all me, too. AND i'm just up the road from you! so to speak. =) hope you're surviving the heat! I love the name of your blog. You asked a question about how quilting has changed my life which really got me thinking. Lately quilting has been the only thing that is keeping me sane. After some recent, unexpected surgery, all I could do was English Paper Piece. I have been making hexagons like a mad women. I know I would have gone crazy without quilting. Very nice to meet you on the hop! You have a lovely (and big!) selection of projects. I laughed when I read the comment about not having actually finished a project yet - I am sure my husband feels the same although it isn't really true (I have finished some!). 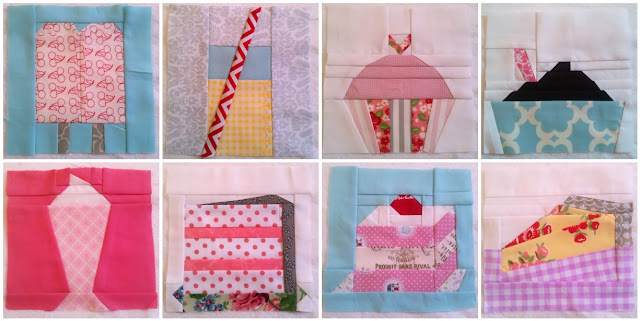 Your pieced dessert blocks are wonderful! I think I am too klutzy to paper piece but you have done a great job. Enjoyed your post very much. Lovely to read about how you got into quilting. Can I just ask one thing about your blog- the text shows up in a very small font on my computer so it is a little tiring to read it- do you know if anyone else has experienced that? or is it just my screen?! Throwing some LGA love your way as a fellow hop member! Ooh.. good question! Quilting has brought so much happiness in my life in the past year because it's given me a hobby to channel my artistic skills into. I come home from work and am able to relax with fabulous colours and the quiet hum of my sewing machine. Happiness to infinity! love your swoon and scrappy trip along.. I see a lot of pink here.. so sweet! Nice to meet you! Quilting has been such a positive creative outlet for as long as I can remember! Keep up the great work! Nice to meet you via the hop! I enjoyed reading about your venture into quilting - it's so interesting to find what motivates others. It's great to have more than one creative outlet. Looking forward to seeing more! Love all of your color choices! Found you via the blog hop - happy to meet you! I love your posy quilt - it's so adorable! And the swoon of course! Great job! I've still gotta get on the swoon bandwagon. It's great to meet you and know more about you! Wow, you've definitely got a lot done in the last six months! I love embroidery (when other people do it -- not much good at it myself) and quilting. Do you think you'll make a project that combines them? I really love some of the quilts I've seen popping up online that are hand quilted with colorful heavy thread. Great blog hop post! I love hearing everyone's reasons for quilting. Your scrappy trip along has inspired me to get going on that project, yours are so good! Great post! I love the embroidery and paper-pieced blocks. Gorgeous! I've seen the paper pieced desserts around blog-land. Delicious!! I very much like your blog name--I have since I started hearing it around the blog hop. A good one! So, you are Swoon-ing too. I am going to have to relent and do one of those soon... :) Nice to meet you! It's nice to meet you! Swoon is on my list of things to do. Yours are gorgeous! Hilarious that you haven't fully completed a quilting project yet. You've done a lot! My brain is always thinking of the next thing to make, and patience usually isn't on my side either. Ha! Love your swoon blocks. That quilt is going to be gorgeous!! Your stuff is super cute. I think we're about in the same place quilting wise... I haven't completed a full project yet. It's nice to met you! I LOVE your Summer Sampler dessert blocks--they remind me of a Wayne Thibaud painting :) Your scrappy trip along blocks look awesome, too and it sounds like you have some good motivation for finishing up some of your WIPs (not that there is anything wrong with having lots of WIPs!). I'm glad to have met you through the blog hop! 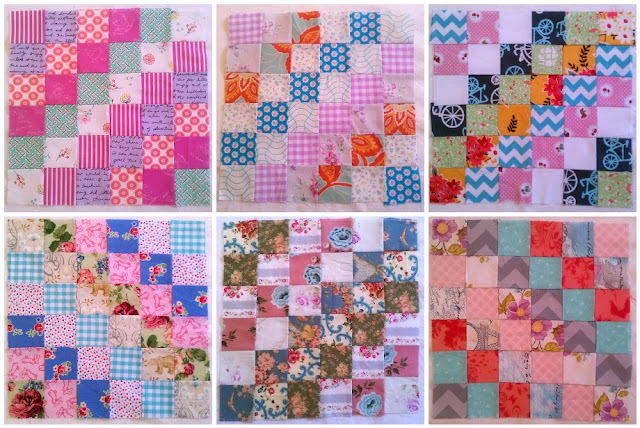 Love all the pinks in the quilts you have shown and your swoon quilt is going to be incredible. I have seen it popping up a lot lately and think it is such a fun pattern! My name is Gwendellyn, just your average full time stay-in-house crafter ♥ I love things that are pink, cute, and more often than not, floral. Please come and say hi! 2013 New Blogger Blog Hop!